Metal detectable silicone rubber and sponge is increasingly being used in the food, drink and dairy industry to reduce the risk of rubber parts ending up in products. Metal detectors situated on the production line identify the metal fragments and stop the line to prevent any metal parts contaminating the food product. Adpol manufacture a wide range of extrusion types, tube and cord in metal detectable silicone rubber and sponge. We can reverse engineer to existing profiles or work to customer drawings. In addition we can supply punched or water jet gaskets from metal detectable rubber sheet in a range of thicknesses, or the sheet just on its own. Metal detectable silicone rubber extrusion profiles can be joined into O Ring or square gaskets and we can also mould in this compound. We can offer metal detectable silicone rubber in different colour and hardness grades and extrude various profiles, mould, make joined gaskets, or punch gaskets from sheet. 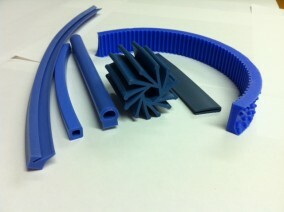 We are one of the first companies in the UK to be able to offer metal detectable silicone sponge profiles or sheeting. This offers a greater degree of flexibility and sealing characteristics for use within the food and dairy industry.